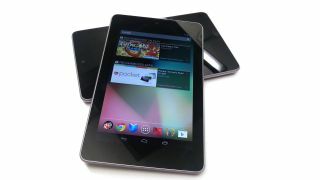 While the notion of a Google Nexus tablet was hardly a shock, the price point of just £159 ($199) was a surprise. 'We've seen a lot of it innovation when it comes to our manufacturing processes, for example using one piece of glass for the display and efficiency improvements in a number of areas. "I think the secret is simply we're very good at manufacturing and design, and we've managed to reduce our bill of materials." "In the case of the Nexus 7, we can [bring it out at such a low cost] because we've committed to large volumes," Tim Smalley, Asus' Digital Marketing Manager, told us. "We're talking very large volumes; in terms of comparisons to previous products in the UK we're going to have several orders of magnitude more at launch than ever before." "In terms of the quantity, the Nexus 7 is so much bigger." There are strong rumours that Google is heavily subsidising the cost of the device as well to get a foothold in the burgeoning tablet market – and even more so when you consider it's offering a £15 ($25) Play Store voucher to every new customer initially. Will the strategy pay off? As TechRadar's editor Patrick Goss noted: "this is a tablet with an entry-level price but a host of high-end specs and Google-fuelled goodies," and that could be the weapon that the search king needs to become a rampant player in yet another market.